Teenager is on a spring break, which means no early morning alarms, no driving him to and from the school, the soccer practice, and any other scheduled and unscheduled activities. For the last two days I slept in almost until noon! That is my very personal record: I don't remember when I let myself to rest this much. But to my defense came my practical wisdom: my body knows better what it needs the most at this moment, so be it. 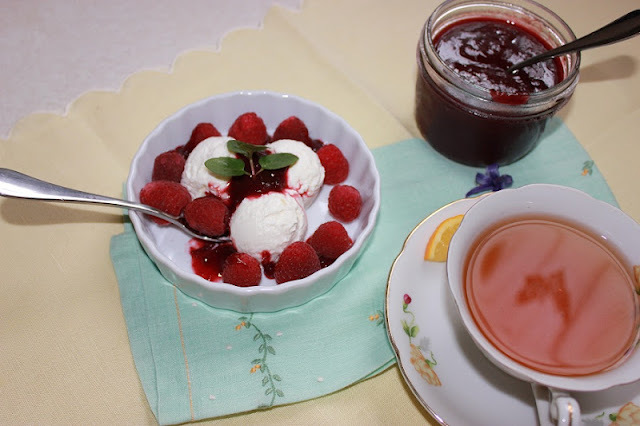 Rested and really energized, I made an unusual breakfast for a weekday: homemade cream cheese with homemade plum sauce and raspberries. I need to tell you that a homemade soft cheeses taste very different from the commercial. When making the cheese I keep it plane to be able to create a different flavors later: from savory to sweet. Making a soft cheese is not hard at all, and no special equipment needed. A gallon of milk, a stainless still pot, a package of culture, thermometer, and a cheese cloth. The end result is a reward to all your taste buds: creamy texture, fresh taste, no preservatives (which is very important in our family), and versatility it provides: I use it in fillings for my savory bread, as a dressing ingredient, a spread, a dessert, you name it. For dinner I made a simple kale chips for my Kale Tuesday with some vegetables and an egg. What Kale meal did you make today? When our work and other responsibilities allow us to do so...:)Thanks Lorraine! I've been feeling kinda the same way - I went back to bed this morning after breakfast and took a nap! Sometimes you gotta listen to your body ..
Sure thing. If we don't listen to our bodies, then our bodies stop listen to us, then we are in trouble! One of these days I am going to find time and attempt to make cheese. Your breakfast looks yummy and I am drooling looking at it. Norma, cheese doesn't take a lot of time. You just need to attend to it from time to time, and soft cheese is very easy to make. I haven't tried hard cheese yet. Good luck! Aha! I'd love that too. Let me know when you start so I can "invite" myself to try it! :) I just told my husband that I don't care how big the house is, but I do care how much land there is. Actually, I do care how small the house is: cleaning is no fun! The soft cheese looks and sounds yummy and very interesting. I think I would love it. 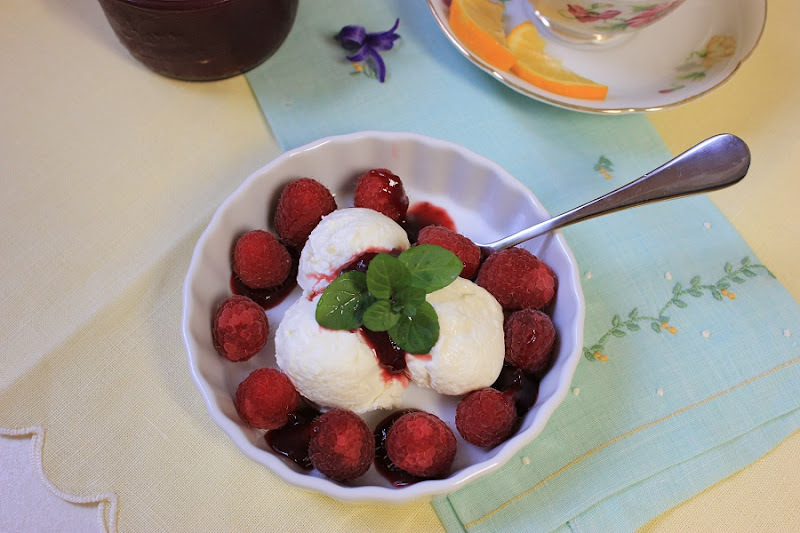 It sounds awesome with the plum sauce and raspberries. The Kale chips sound wonderful. I love kale, but I don't make it very often, but the chips could really work for me. 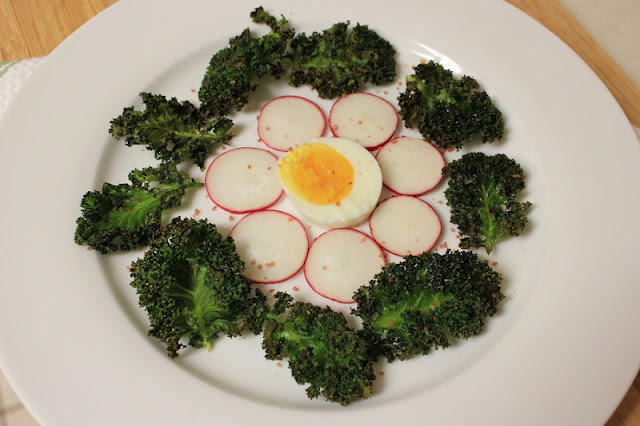 The plate with the boiled egg, radish and kale is very beautiful. The colors are stunning and look delicious! Have a fabulous day. Thank you Ginger. I stated this Kale Tuesday to force myself and family to have kale at least once a week, and fell in love with it. Now I have kale a few times a week. Here in Greece schools have two weeks break for Easter holidays and I can't wait for them. Perhaps I am more eager than my son. Just to get rid of the hectic school rythm of everyday. You kale looks very healthy and inviting! Soft cheese is project that's in my things to do. You paired yours perfectly with the raspberries! That's thoughtful, parents and kids can visit families and do things together around Easter. I would love to see it here, although we have one year and a bit left to graduation. Thank you Lizzy. I am in the dessert mode this spring brake! What a gorgeous breakfast! Very nice indeed!